Gabi A. (57) from Germany on 06.11.2017. “Before the beginning of my fifties I rarely had problems with my figure. Well, I never had a model figure but on the wholeI was satisfied. However, with the onset of menopause, I rapidly gained weight and wasn’t able to lose any. I eventually reached a size 44 and didn’t feel comfortable in my own skin. My husband always said that he likes me as I am. Despite that, I tried various diets from magazines, but without the desired success. Eating half portions, various protein shakes or starvation diets only provoked a bad mood and caused attacks of hunger, a vicious circle. In the summer of 2017 my husband died suddenly and my world turned upside down. As I slowly began to rearrange my life, I decided to do something for my body again. I remembered the reports about HYPOXI, which I noticed recently in the newspaper. Although I was very sceptical, if this would be the right way, I agreed to a trial session in the HYPOXI-Studio Bayreuth. The first impression in the studio was positive. They explained in detail, about the effectiveness and the structure of the training. The trial session surprised me pleasantly and I decided – still with some doubts – to start the training. jeans in size 42, after 6 weeks I fit once again in a size 40. Even though I was on vacation in Greece for a week in October and thoroughly enjoyed the delicious Greek food, I didn’t gain weight! My metabolism is so well activated by the training that even small sins don’t cause any harm. I don’t have to follow any special diet. On the contrary, I can really feast and only pay attention not to eat carbohydrates after the training or generally in the evening; as I said: small sins included. Many delicious recipes are supplied by the studio. In addition, I would like to mention another great side effect: Through several operations, my lymphatic system in the legs is severely impaired and I permanently suffer from water retention, especially in the feet. Since I’ve been doing the HYPOXI-Training, I do not have this problem anymore. I can even wear my former shoe size again (due to the swelling, I always had to buy 1 size bigger). 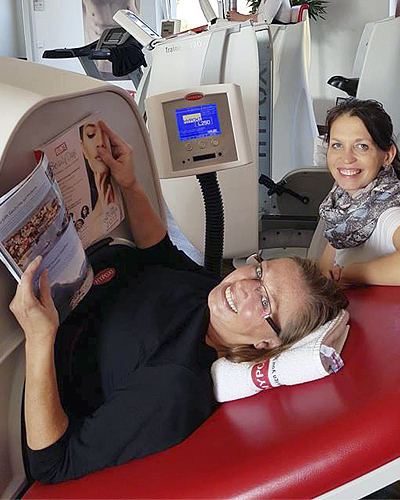 I look forward to every appointment at HYPOXI-Studio Bayreuth, the team around Tina and Kirk is like a big family! Each customer is individually advised and looked after. The skin tightening program is very pleasant and relaxing, the workout itself is created for everyone to manage. My goal is to be able to fit in a size 38 again by Christmas and it looks like I’ll do it before. »Mum, you look really good!« was the nicest compliment I’d received from my daughter a few days ago. Friends and family also admire these positive changes.